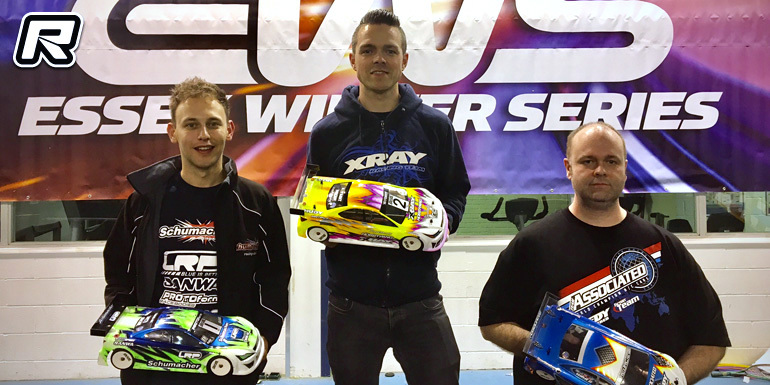 The fifth and final round of the Essex Winter Series took place this weekend. With a new scoring system in place this year, the results of this event would be crucial to decide the champions. The Modified Touring title fight was a straight battle between Elliott Harper, winner of the first three events, and Olly Jefferies, who took the win at round 4. Olly got proceedings and his Hobbywing debut off to the best start, topping the opening qualifier with his Xray, ahead of Elliott and the Team Associated trio of Matthew White, Chris Grainger and Alan Bickerstaff. Q2 moved Elliott to the top with his LRP-powered Schumacher setting the fastest time, Olly second and Alan third. Elliott topped the third round, ahead of Olly, Chris, Matthew and Yokomo youngster Harley Eldridge. The final qualifier saw a titanic battle to decide pole position, with the two contenders never separated by more than a few tenths of a second. Elliott snatched the win, and with it the pole position, by just one tenth of a second in front of Olly. This moved Elliott one step closer to the title, giving him a five-point lead ahead of the single leg A-final. Elliott and Olly led the field away, quickly building a gap over the chasing pack. Olly remained close behind Elliott, initially not quite close enough to attempt a move, but Elliott knowing one small mistake would likely see him lose the lead. Behind the leaders, Matthew, Alan, Chris and Harley raced hard for third place, and a potential third overall in the championship. Out front, the one mistake came, and it was from Elliott. Getting his car sideways at the end of the straight, Olly didn’t need to be asked a second time and snuck through the narrow gap to take the lead. Elliott continued to hound Olly for the remainder of the five minutes and, despite one moment where he managed to get alongside to attempt repay the favour, couldn’t find a way to pass. Thus Olly ran out the winner, with Elliott’s runner up position enough to see him lift the overall EWS Scorpion Modified Championship for the second consecutive year, with Olly second overall and Alan’s fourth place finish giving him third overall ahead of his team mates. In the Super Stock Class, Zak Finlay got his run at the title underway by setting the fastest time ahead of Xray team mate Marcus Askell. Richard King (Awesomatix) took third in front of the other main championship challenger Tony Broad. Marcus went fastest in the second round, ahead of Zak, Tony, Ben Pedersen and Daniel Blake, to lead an Xray 1-2-3-4-5. Zak was back on top in the third qualifier, ahead of Marcus, Tony, and Ricky Copsey, making his first run after switching to a privateer Awesomatix. Zak Finlay secured pole position and took a step closer to the Super Stock Championship by going quickest in the final round ahead of Marcus, Tony, Ricky and Tonisport/Tamiya driver Keith Dempsey. Zak made a clean start at the front of the A-final, whilst Tony appeared to have found a little more speed and hustled Marcus from lap one. Whilst Tony and Marcus continued to fight, Zak got his head down and extended his lead out to around two and a half seconds. Tony tried everything he could, but the former series champion could not get past Marcus, who drove a perfect race under pressure. Therefore, out in front Zak had a lonely drive to secure both the win and the overall EWS Super Stock Championship. Tony still finished second overall, with Marcus’ strong run of results in the second half of the season lifting him to third overall. 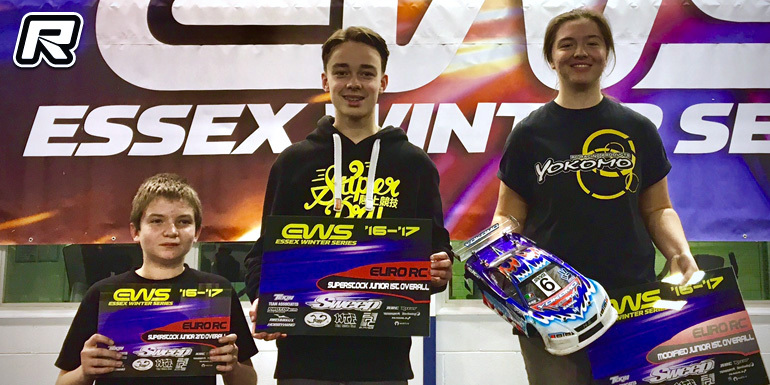 In the Junior rankings, Harley Eldridge’s top 10 result had her taking the Modified trophy, whilst in Super Stock, Bradley Coaker took the top spot with 454 points, just ahead of Adam Southgate (442), Thomas Gill (421) and Oscar King (230). Full results from round five, along with the Championship standings and tech charts which will follow shortly, can be found here. The EWS Events team now have a short break before returning for the EWS International, which takes place 31st March to 2nd April to round out the UK and European carpet season.